In our previous post on the value of user research, we talked about how user research ought to serve two key business goals: 1) Design the right thing, and 2) Design it the right way. In this post we’ll go further into the how user research helps your organization zone in on what’s important. Start by answering these key questions. This question ties back to your first business goal: “Design the right thing.” While in some cases the problem may seem obvious, user discovery research done well is very likely to uncover new insights into your users’ journeys. Spending time and energy on user research at this stage is one of the best investments your company can make. Start with your problem statement. User research is mandatory to ensure your problem statement captures a significant pain that your users are facing. Without user research your existing ideas about the problem will be based on assumptions, some of which are likely to be false. You must get to know your users, their life circumstances, their routines, their frustrations, and their desires. Involve key designers in the research process—and potentially others on the team as well. The greater overall understanding and collective empathy your team develops for your users, the more likely you are to zone in on the heart of the problem. Your goal in the early stage should be to generate data and gather new insights. Looking at what people actually do or don’t do can provide more accurate information and deeper insights into a problem than what people say. The Lean Startup Strategy to learn about your problem includes Root Cause Analysis and a scientific approach ensures that observation and data will win out over bias and assumptions. While it may feel like progress if you zone in on a problem statement quickly, rushing this phase to start designing and building can actually be one of the biggest pitfalls. Without a well-researched understanding of the problem, grounded in what can be observed and confirmed by user research, a rushed design will likely turn out to be time and resources wasted in pursuit of the wrong goal. The further your organization progresses down the path of designing and building, the more difficult it is to revise the problem statement. This phenomenon resembles what Mike Norton, Daniel Mochon, and Dan Ariely termed the “Ikea effect”. In their experiments, undergraduate participants were asked to judge the value of Ikea boxes, origami creations, and Lego structures. They found that participants who assembled the final products themselves also believed that the products were worth more money. In other words, we get attached to the things we make, and believe them to be more valuable than they are. This implies that as soon as we begin building a solution, we are already invested in the version of the problem that our solution is designed to address. This first stage of information concludes when your team (or organization) aligns around right the problem statement. Full alignment is key! With a shared agreement that you are solving the right thing, you can now approach goal two: solving it the right way. The Easy Part: Agreeing with all of this in theory. The Hard Part: Putting it into practice. Investing time and resources into researching the problem, given tight timelines and limited budgets. Holding off on defining the problem too soon. What is the most effective way to solve that problem? Once you have engaged in user discovery research, developed a deep understanding of your users’ pain points, integrated this with other requirements (e.g. tech requirements, legislative requirements), and aligned as a team around a clear, specific problem statement, you are now ready to begin tackling your second business goal: “Design it the right way.” This is where your company begins designing, prototyping, and testing. At this stage, you are trying to figure out the best solution to the problem at hand. Once again, it is helpful to employ a variety of methods in order to gain sharp and well-rounded insights. Both quantitative and qualitative methods can be useful here, though in early stages of design, qualitative research may be most useful. It is important to recognize that quantitative and qualitative methods answer different questions: quantitative methods can indicate the extent of a problem, while qualitative research is needed to understand why users are experiencing the problem. Furthermore, different insights can be gleaned from testing in different contexts: testing in users’ natural contexts allow you to understand how the user interacts with your product over time. However, the ability to observe behaviour directly in a controlled study may offer insights that could not be gleaned from field research. Usability sessions can efficiently expose whether your application is intuitive for the user. The Ikea effect is also relevant as you design and build your product. Once again, there is a risk of becoming attached to particular designs. This is where keeping the user at the centre of the design process is key to success. A solid framework is needed for incorporating user research into your design process. 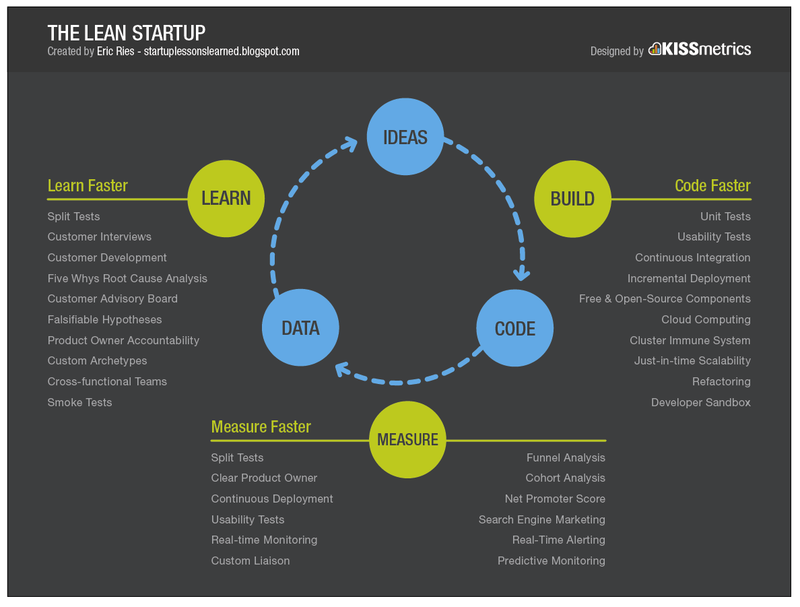 The Lean Startup’s Build-Measure-Learn framework offers a simple, cyclical process for how user research and design can complement one another. As you engage in this process, it is important to stay focused on your ultimate goal. This will help you to answer the question: What are you measuring? If you measure people’s preferences but ultimately care about their engagement with an application, you may not get the feedback you are truly looking for. You may not be able to measure your outcome of interest at early stages of designing, but it should be well defined, and in the later stages, you will want to assess the efficacy of your app along this measure.